A car's engine needs cylinder compression to run correctly. This compression is caused by the engine pistons traveling upward to the top of the cylinder bore and then downward via the crankshaft. When a engine's compression is low in any particular cylinder it will cause a misfire which could trigger a check engine light. When there is no compression across all cylinders the engine will not start for example when a timing belt or chain breaks. When having a compression test done by a repair shop the costs will vary depending on how many cylinders your car's engine has and how difficult the sparkplugs are to remove. Most shops will charge about $80.00 for a 4 cylinder and about $140.00 (US) for V8 engine's. If you are doing the job yourself with the help of this guide a gauge will cost you between $17.00 and $30.00 (US) on Amazon depending on the quality and adapters included with the gauge. 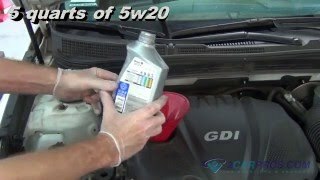 If you just need to know if the engine has compression at all, in another words the engine does not run and you want to check if any of the cylinders have compression you can do so by using a simple paper towel which we will show you further down in this guide. The engine should be warm but not hot so you don't burn your hands. Some mechanics like to run the test when the engine is at operating temperature but that makes little difference in today's engine. You will need a sparkplug socket and a compression gauge. It's a good idea to wear gloves and protective eyewear as well. 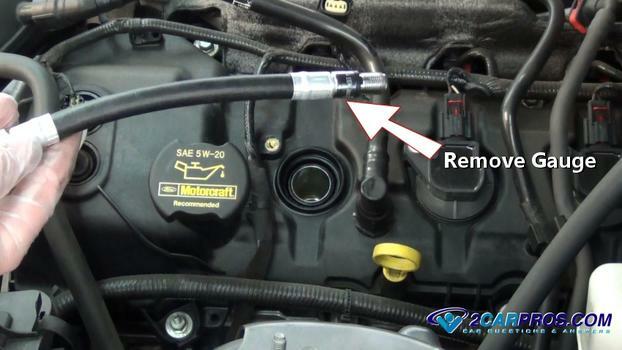 If you are checking the compression of one particular cylinder remove the fuel pump fuse to disable the engine from starting. This will also keep fuel from entering the cylinder which will stop any fire hazard from occurring while all of the sparkplugs are removed. You can't find the fuel pump fuse by checking the fuse panel or your owners manual. 1. 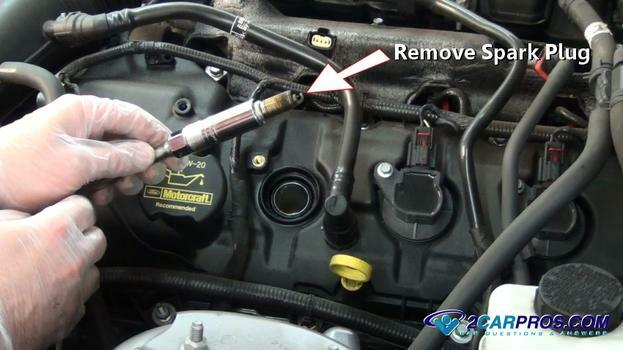 Remove All Sparkplug Wires or Ignition Coils: Remove the sparkplug wires or ignition coils from each cylinder. Use a small piece of tape to mark the plugs wires so you don't get them mixed up when putting them back on. 2. 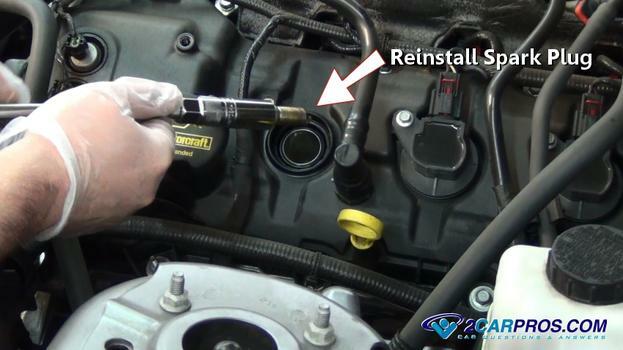 Remove Sparkplugs: Use a sparkplug socket ratchet and extension to break loose and remove all of the sparkplugs. While removing the sparkplugs keep them in order of the cylinder they where removed from. 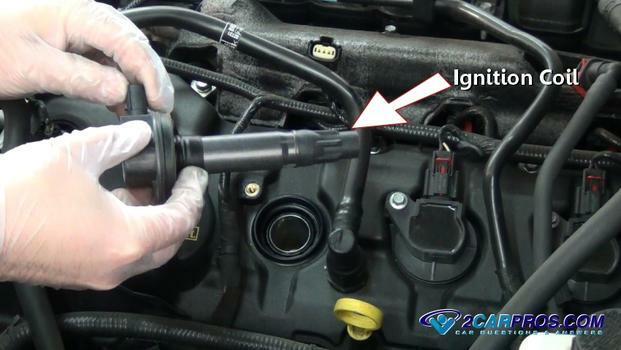 This will aid in the inspection of the plugs if a problem with a cylinder's compression is found. 3. Insert Compression Gauge Hose: The compression gauge will have a rubber hose attached to a metal fitting which has threads that match the sparkplug. This will enable the hose to thread into the sparkplug hole. Tighten the hose by hand until it seals against the O ring on the gauge hose. 4. 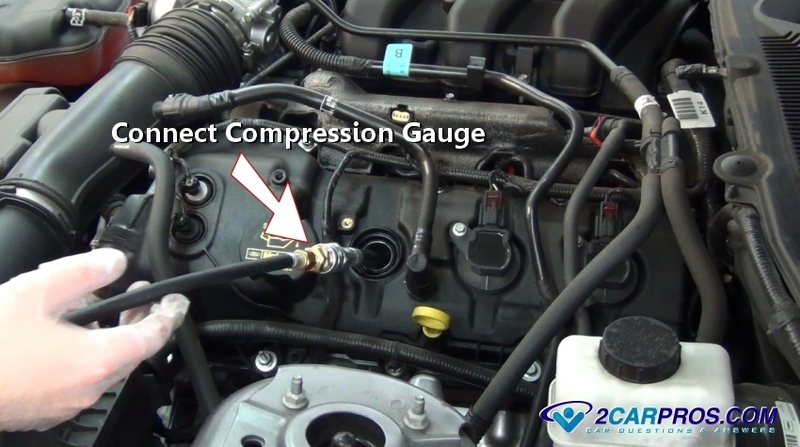 Attach the Compression Gauge: The gauge will be fitted with a connector that will attach to the compression gauge hose. 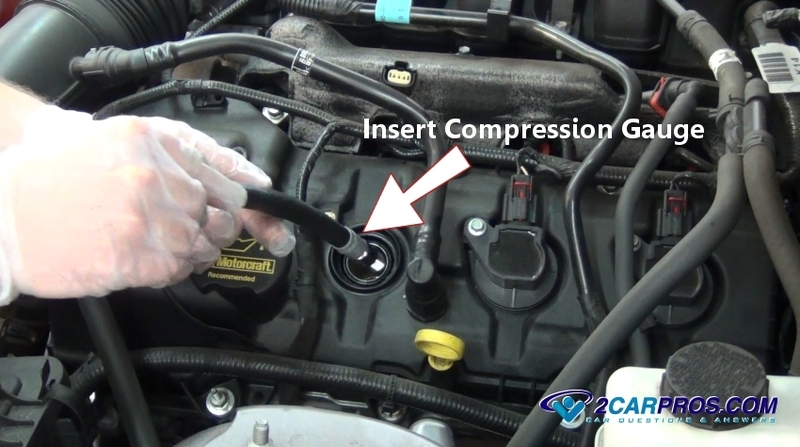 Lift the connector ring and push downward onto the hose. You should feel a solid connection between the gauge hose and the sparkplug hose. Some gauges do not have a separate hose and will directly screw into the sparkplug hole. 5. Crank the Engine Over: If you are just testing one cylinder be sure to pull out the fuel pump fuse so the engine does not start. 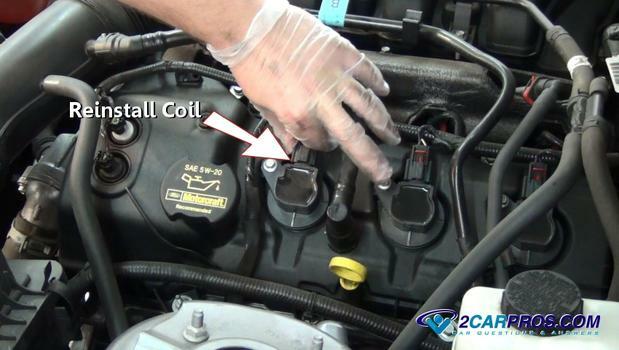 On older engines you can pull off the coil wire. 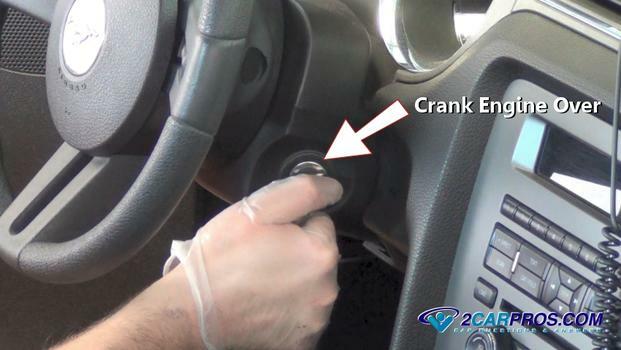 All compression tests need to be done at a regular engine cranking speed. Insert the ignition key and crank the engine over for about 10 seconds. This should give the gauge enough time to gather the correct cylinder combustion pressure. 6. 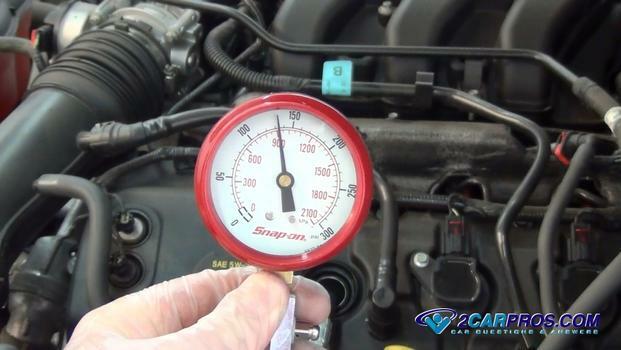 Observe the Compression Gauge: The gauge will start to climb on the first rotation of the engine and continue to climb until max pressure is achieved which should be noted down. Typical compression readings will be between 125 psi and 160 psi. 7. Remove the Compression Gauge: Once the test has been performed remove the compression gauge by unscrewing the test lead from the cylinder. 8. Reinstall the Spark Plug: Inspect the sparkplug for damage and then gently install it back into the cylinder and torque it to factory specifications which are usually between 15 and 20 pounds. 9. Reinstall Coil or Plug Wire: Gently install the coil or plug wire back into place while firmly pushing it downward onto the sparkplug terminal. Continue to test each cylinder in the same manner. All cylinders should be within about 5% of each other. If you observe a cylinder that has low compression there is a problem. Press the pressure release valve on the side of the gauge which will return the gauge to zero pressure for the next test. 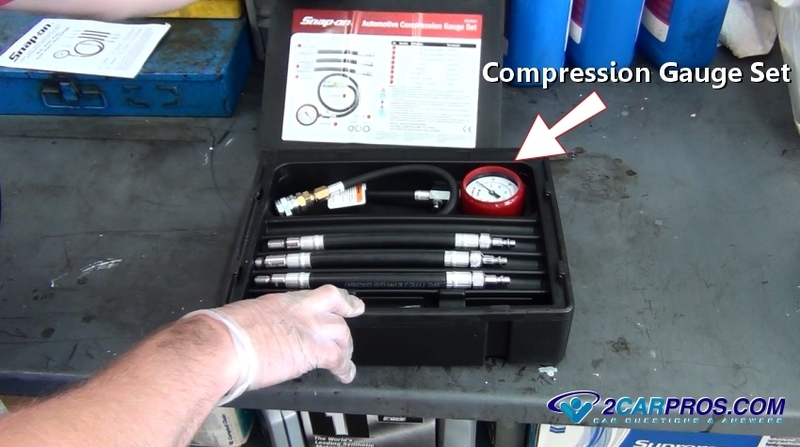 In this video we are doing a test using a gauge which measures the amount of compression in any one cylinder. 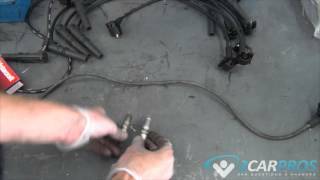 In this video we are checking if an engine has compression it see if a timing belt or chain is broken. This test can be done without using a gauge. If you have any questions about engine compression, please visit our forum. If you need car repair advice, please ask our community of mechanics who are happy to help. Our service is always 100% free.